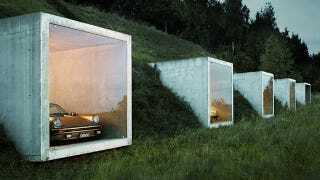 The architects at Peter Kunz Architektur have built our new our dream garage: five concrete cubes protruding from a Swiss mountainside. The project was started in 1998 and completed the next year in the Swiss municipality of Herdern. Four of the cubes are walled off in glass and the fifth is open, leading back to a garage with space for eight cars. A concealed stairway leads above ground. Just add a brown Porsche and you've built the ultimate minimalist chic garage the world has ever seen!